22 Oct and 16 Dec 2018-Atlanta Falcons! You are here: Home / News / 22 Oct and 16 Dec 2018-Atlanta Falcons! RISE UP! 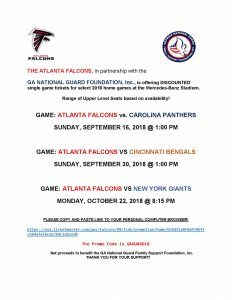 The Atlanta Falcons are offering discounted single game tickets through the GA National Guard Foundation for select 2018 home games at Mercedes Benz Stadium. SHORT SUSPENSE TO 12 OCT 2018! Great opportunity to make this a family friendly event! Please see attached flyer to COPY AND PASTE LINK TO YOUR PERSONAL COMPUTER BROWSER. Net proceeds to benefit the GA National Guard Foundation. Thanks for your support!